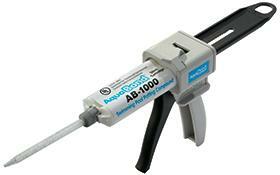 Save up to 70% on Your Pool Light Potting Compound Costs! 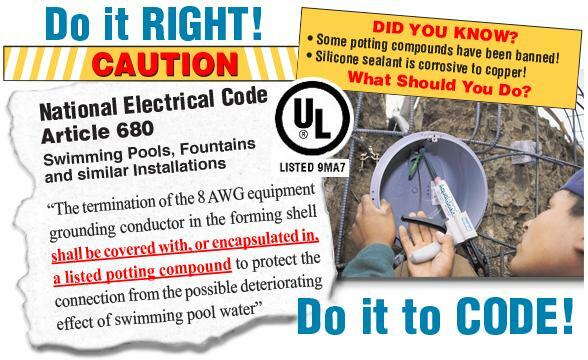 AquaBond® swimming pool light potting compounds encapsulate and waterproof electrical connections in swimming pool, fountain and spa lighting fixtures. UL listed, they meet National Electric Code requirements for potting wet niche 8 AWG grounding conductor terminations. Their unique aqua-blue color is easy to identify as a properly encapsulated connection and is preferred by electrical inspectors nationwide. Both our AB-1000 and ABP-1000 wet niche potting compounds provide protection against corrosion and the possible deteriorating effects of pool water – and allow the use of rigid nonmetallic conduit in the installation of wet-niche underwater lighting fixtures in swimming pools and spas. Do it Right… Do it to code! Save up to 70% on wet niche potting compound costs! Encapsulate 5 to 8 wet niche pool light bonding lugs with one resealable, 50ml cartridge or encapsulate 1 to 2 with our single-use pouch! SAFE TO USE… We’re deca-BDE Free! 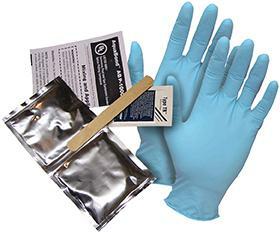 Many states have enacted laws that prohibit the use of any product that contains more than 0.1% deca-BDE. 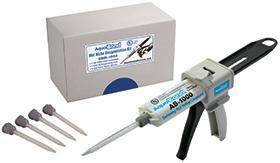 Our potting compound, AB-1000 and ABP-1000, does not contain deca-BDE and is UL listed. AquaBond is compliant and meets with EPA, IARC Monographs, OSHA and National Toxicology Program standards.